Read through The Message in one year in just ten minutes a day! 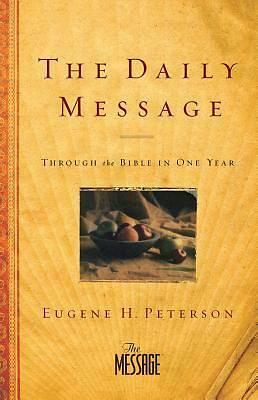 Arranged into six readings per week, The Daily Message is the perfect one-year reading Bible, allowing for both flexibility and time to let the readings soak into your heart and mind. This innovative approach to reading God's story cover to cover, one day at a time, features the life-changing, everyday language of The Message. Whether you've read the entire Bible multiple times or want to read it all the way through for the first time, The Daily Message will revolutionize your daily quiet time and help you go deeper in your relationship with God.